Two committee members, BJP MPs Nishikant Dubey and Ramesh Bidhuri, have said that they would not allow the report to be adopted and wanted to give dissent notes. New Delhi: Terrified that labour ministry’s own data on job creation would raise embarrassing questions, the Narendra Modi government is trying to derail the estimates committee report on GDP (gross domestic product). The data would expose the “jumlas”, as a senior committee member puts it, on job creation during the tenure of the Modi government. While campaigning in 2014, Modi had promised to create 10 million new jobs a year. Two committee members, BJP MPs Nishikant Dubey and Ramesh Bidhuri, have said that they would not allow the report to be adopted and wanted to give dissent notes. A meeting to adopt the report was held on schedule yesterday under the chairman of the committee, the BJP’s Murli Manohar Joshi. Sources say that both the BJP MPs, acting on clear instructions from party bosses, insisted that the notes of dissent be included. Joshi, who had lead the Public Accounts Committee (PAC) which exposed the 2G scam, would have none of this. Sources say he told both the BJP MPs that financial committees like the estimates committee, according to Parliamentary conventions, do not carry any notes of dissent as they are based on the data provided by the government itself. So what the labour ministry submits is sacrosanct. The trouble is that the Modi government has been disregarding labour ministry data on employment and in recent times has relied on statistics put out by the EPFO, which have attracted criticism. Significantly, even while the meeting was going on, BJP leader Vijay Goel, who is not a member of the committee, was seen outside and communicating with the party MPs. Sources say that Goel was sent as an emissary by BJP president Amit Shah. Joshi finally told both rebel BJP MPs that he wanted written testimony from them which the committee would consider and gave them a week’s time to come up with counter arguments. He warned them that the report would be adopted only after that. Bidhuri then tried to say that he could not give written objections as he was busy in election duties and he was a first-time member of the committee. Dubey on the other hand, first raised vocal objections and then finally agreed to contribute some testimony. Authoritative sources say that the report is likely to leave the Modi government red-faced as the labour and statistics secretaries have admitted that they have no “real-time data on job creation” . The panel’s report has also pointed out that realistic estimates on unemployment at a particular time on various important parameters is not available. While India has been struggling with a sluggish growth of employment generation in the last decade, a large chunk of the jobs was severely affected after Modi decided to implement demonetisation and the Goods and Services Tax (GST). A Reserve Bank of India-backed research report stated that during the first two years of the Modi administration, employment in 27 sectors fell by 0.2% and 0.1% respectively. This happened even though GDP growth was at a decent 7.4% and 8.2% in 2014-15 and 2015-16 respectively. This resulted in a loss of nearly 10 lakh jobs, according to the research. Other independent estimates of job losses and employment rates, such as by the Centre for Monitoring Indian Economy (CMIE), also have not painted a flattering picture. In the last year, Modi has given a number of interviews to friendly publications, wherein he has stated that “jobs were being created but the data did not reflect them”. He has often claimed that work such as “pakoda frying” are productive jobs but are not reflected in organised sector data. Significantly, the government has shown little respect for parliamentary checks and balances. Last month, it removed the BJP’s own B.C. 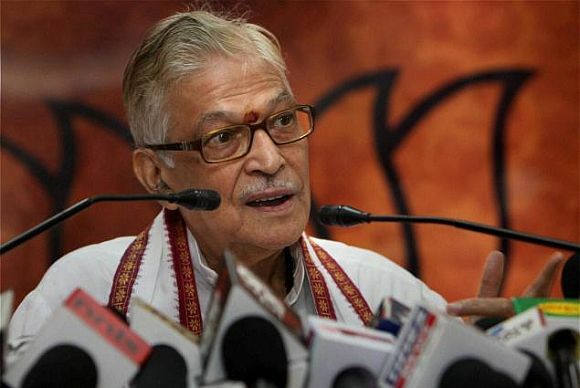 Khanduri as the chairman of the defence committee, replacing him with Kalraj Mishra, after the committee gave a report which made adverse remarks on India’s defence preparedness. BJP members also derailed a report of the standing committee on external affairs chaired by congress MP, Shashi Tharoor which had taken the government to task over the Doklam stand-off with China. Joshi is a BJP heavyweight with a hotline to the Sangh so the Modi government cannot directly remove him but, sources say is now considering it specially after he asked former RBI chief Raghuram Rajan to depose before him on the NPA crisis. The Rajan list of fraud NPA’s and given to the PMO for “coordinated investigation” has also been demanded by the estimates committee. Joshi has asked the PMO to tell the committee what action they took on the fraud NPA’s. Joshi’s term as the chief of the estimates committee will last till April 2019.